What Are MEDca Nasal Strips? There are many snoring aids on the market right now. Some of them, like those featured on our list of the best snoring aids for 2017, are downright amazing. However, before you purchase a snoring aid, you should think about what it is that you want from it. If you don’t feel like wearing mouthpieces or chin straps, then our MEDca Nasal Strips review might be a good place to start. Like most other nasal strips, MEDca Nasal Strips work by opening up your nostrils, which tend to collapse during sleep and cause snoring and other breathing problems. When you apply these strips to your nose, right above the nostrils, the elastic spring-like band in the middle tightens and pulls the skin off your nose gently but firmly, keeping your nostrils from collapsing. 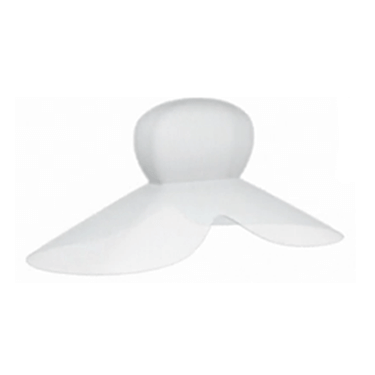 This improves airflow by some 30% and leads to a serious reduction of snoring. 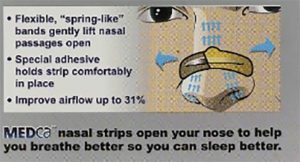 Some people start snoring much less than before using these nasal strips and some even stop snoring altogether. In addition to the anti-snoring properties, MEDca Adult Tan Nasal Strips can also be used during exercise to keep airflow normal. You can also use them during allergy bouts or whenever you feel your nose could use some extra help. If you have tried some other snoring aids, then you surely know they come with a few quite serious side effects. For instance, some mouthpieces cause teeth and jaw pain, drooling, and dry mouth. Also, many of them cannot be used by everyone – people with dentures cannot use MADs, those with certain skin allergies cannot wear chin straps, and so on. MEDca Adult Tan Nasal Strips do not have any of these side effects and can be used by anyone, even children. They are extremely comfortable and convenient. 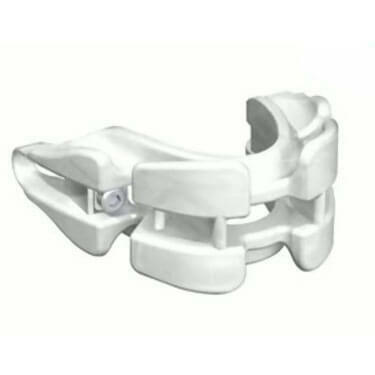 They do not require any particular fitting nor do they need special maintenance and care. 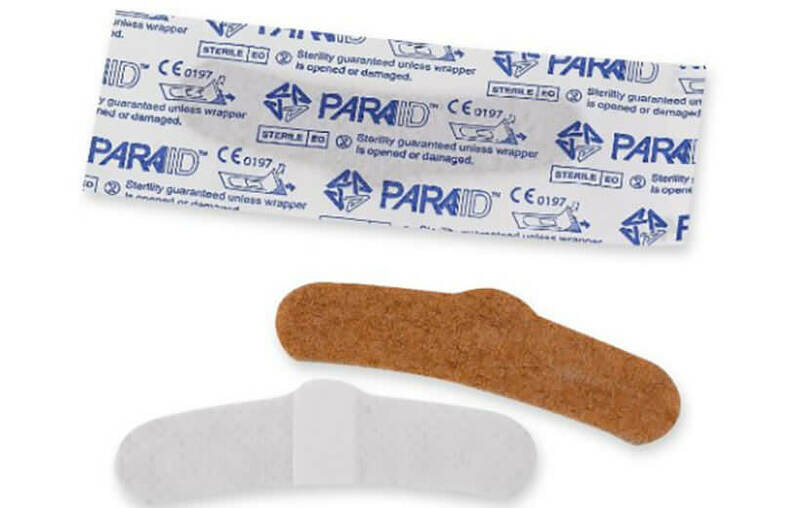 They are disposable – you take the strip off in the morning and throw it away and use a fresh one the following night. They come in different sizes – the large ones may better suit men whereas the smaller ones may be a better choice for women. 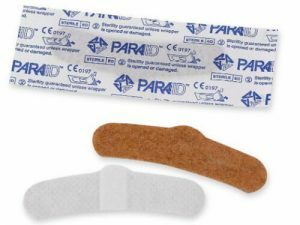 As we already mentioned in this MEDca Nasal Strips review, they are very light and simple and do not require any fitting, molding or special preparation. However, you do need to clean your nose and the area around it before applying these strips; otherwise, they will not adhere well and you will risk losing them during the night. It is recommended to clean the face with warm water and to use soap to remove any residues of skin oil, makeup, and dirt. Take a nasal strip out of the package and remove the plastic backing. Place the strip on your nose, with the spring-like band across the bridge of your nose and the sides just above your nostrils. Press firmly with your fingers to make it adhere all the way. If you have any doubts, consult the instructions that come with the package. In the morning, simply remove the strip (it does not hurt or cause any discomfort) and throw it away. These nasal strips generally stay on throughout the night, especially if your skin is cleaned well, but don’t be surprised if they slip and come off during very warm nights or when you are sweating excessively. The package of 30 MEDca Adult Tan Nasal Strips costs $8.99. You will notice that this is a fairly affordable price, especially compared with other snoring aids, like MADs and TSDs. Compared to other nasal strips, they fall somewhere in the middle. If you are still unsure if MEDca Adult Tan Nasal Strips is right for you, check out the key advantages and flaws of this snoring aid. If you are looking for quality, affordable nasal strips, then our MEDca Nasal Strips review definitely gave you some food for thought. They come in two different sizes and in a convenient 30-piece package. They open the nasal passages by 30% and they are completely drug-free. Available over the counter, these nasal strips are a safe and reliable ally against snoring. Our ratings are the result of an objective and independent evaluation of MEDca Adult Tan Nasal Strips, generating the final rating that reflects the overall quality of the company. Ratings may change as the product introduces changes. MEDca Adult Tan Nasal Strips user rating based on 5 user reviews. I have a very wide nose and these felt a bit uncomfortable since the strap connecting the two strips felt short and got my nose sore after couple of nights. When it comes to effectiveness, this product is pretty weird. It works some of the time for me but not all the time. Also, I somehow remove it pretty often while I'm sleeping. The strips arrived pretty quickly after my order and they looked pretty good when it comes to material and design. They weren't uncomfortable like my previous brand and didn't rub against my nose. Most importantly, they simply work! They've reduced my snoring significantly and allowed me to breed naturally all night long. These strips are soft and comfortable but I don’t really feel they lift my nostrils open as much as some other brands. I still do snore way less than without them, tho. For a while I had a problem with MEDcastips because they didn’t stick well, but I think they’ve improved on this now, because they stay on until the morning. 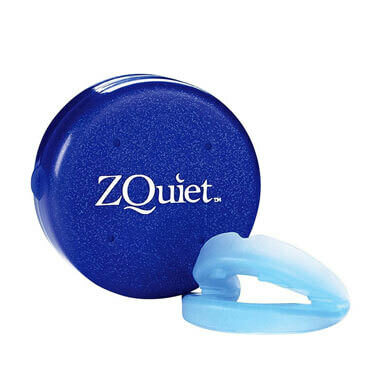 Great product, excellent for those who snore from the nose. I can’t imagine ever sleeping without them. We found 0 verified MEDca Adult Tan Nasal Strips discounts for April, 2019. There are no MEDca Adult Tan Nasal Strips coupons or discounts right now. In order to be sure that MEDca Adult Tan Nasal Strips truly is the best solution for your snoring troubles, you need to know what makes it superior or inferior to its alternatives. Discover how MEDca Adult Tan Nasal Strips compares to other popular snoring aids of its kind with our detailed feature and price comparisons and easily determine whether you are making the right choice.